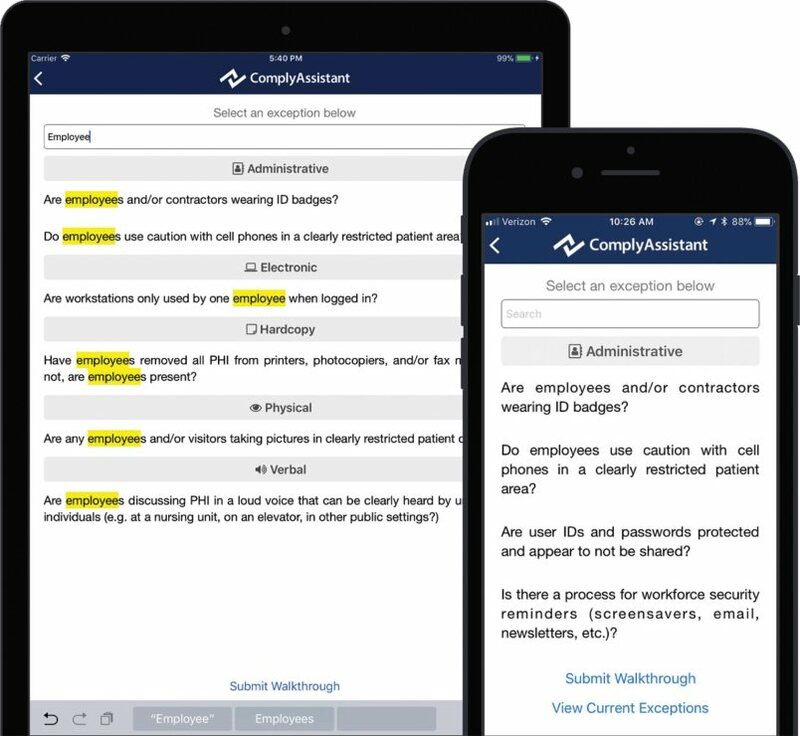 ComplyAssistant’s mobile application is an easy-to-use healthcare compliance audit tool, right at your fingertips, making walkthroughs and audits faster and more efficient. Imagine a typical security audit. Your team, dispatched to various locations with notepads and pens, taking notes on exceptions to your security and compliance protocols. Then translating those notes into a report once they get back to the office. This process can take hours or days, not to mention potential lost or inaccurate information trying to translate handwritten notes. 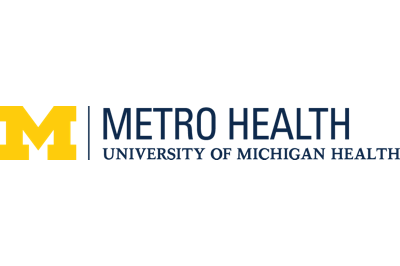 Your team needs automated healthcare compliance audit tools to make this process easier and faster. That’s why ComplyAssistant’s mobile application is your go-to hand-held companion when performing security audits. With your smartphone or tablet, all you have to do is login to our secure mobile application, select your facility and type of audit, and the app will take you step-by-step through the audit process. The app is pre-loaded with a picklist including dozens of issues and exceptions, and allows you to take notes on the fly. Whether using a personal or hospital-issued device, rest assured that any data, including photos, you collect via the mobile app is housed securely in our system, not on your device itself. All information collected via the mobile app is safely encrypted while syncing directly with our healthcare compliance software. Once you’re ready to complete your report, simply open the web app, select your report and immediately take action! Get rid of manual note pads and note-taking. No more lost or forgotten information. 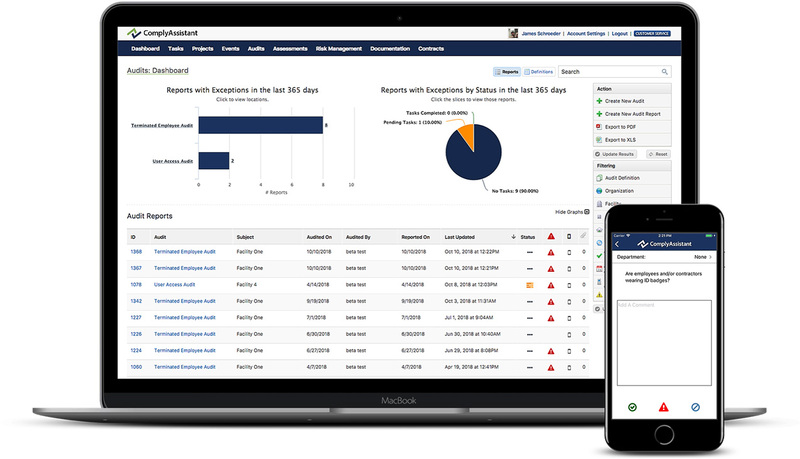 Save hours of work aggregating details and trends with our mobile healthcare compliance audit tools. In this example, auditors can search or choose from a list of pre-loaded exceptions, categorized into groups like administrative, building, staff, physical, verbal and more. There is no limit to the number of use cases for ComplyAssistant’s mobile healthcare compliance audit tools. Our mobile app can be customized for your organization’s needs and workflow.